The unsung heroes of the single-camera comedy revolution are the editors. Sure, we’ll talk about the great, joke-packed scripts that give shows like 30 Rock or The Office an astounding laugh-per-minute ratio. Yeah, we’ll praise the casts who keep that energy up throughout an episode’s running time. And if we have time left over, we might even talk about the directors who make sure the pace keeps going, going, going. The secret to comedy, particularly when there’s no laugh track or live studio audience, is pacing, and even a not particularly funny show can gain some points so long as it’s paced really well. The actually funny shows, though, can base their success on whether that pacing translates from the set out to the audience, and over that precarious gap steps the editor. The best-edited comedy on television right now is Fox’s New Girl, and it’s a pity that the three episodes it has submitted for contention may get squeezed out by shows that can’t approach the way its editors control its chaos. All three episodes would be worthy choices, but the best of the three is “Cooler,” the episode that returned drinking game True American to the airwaves and finally united the show’s central will-they/won’t-they couple Nick and Jess for a surprisingly steamy kiss. The other two episodes submitted—“Katie” and “Pepperwood”—each have their virtues, but “Cooler,” edited by Steven R. Welch, earns its place in the pantheon of recent great comedy episodes by virtue of applying its whiplash-inducing pace to both its comedic and dramatic aspects. There’s perhaps no better show on television right now at cutting between one character saying something amusing to an amusing sight gag for the next scene, thus creating even bigger laughs from the juxtaposition of the two bits of comedy into one bigger bit. “Cooler” is full of moments like this, particularly in the True American game, or when the three guys who live with Jess head out to the bar to try to get lucky (and run into Brooklyn Decker and Brenda Song, among others). Welch enhances the comedy by choosing exactly the right moments to cut, exactly the right beats to highlight before everybody’s on to the next thing, and it’s what keeps the whole enterprise humming with great jokes, rather than collapsing under its own weight. The chaos of something like True American could just feel like a bunch of people shouting on other TV shows, but thanks to the stalwart work of Welch (and, it should be said, episode director Max Winkler), True American almost seems like something that could be played at home, if only one could figure out the rules. Rather than simply turning into a bunch of people shouting random names at each other, True American feels like a real drinking game, one with as convoluted and specious a history as it’s supposed to have within the show. And, yes, the writers and cast and Winkler should be credited for that, but so should Welch. Yet his strengths are even more apparent in the episode’s dramatic moments, such as when Nick first reveals to Jess that he’s had thoughts of kissing her while the two are locked together in a room where they’re supposed to be making out. 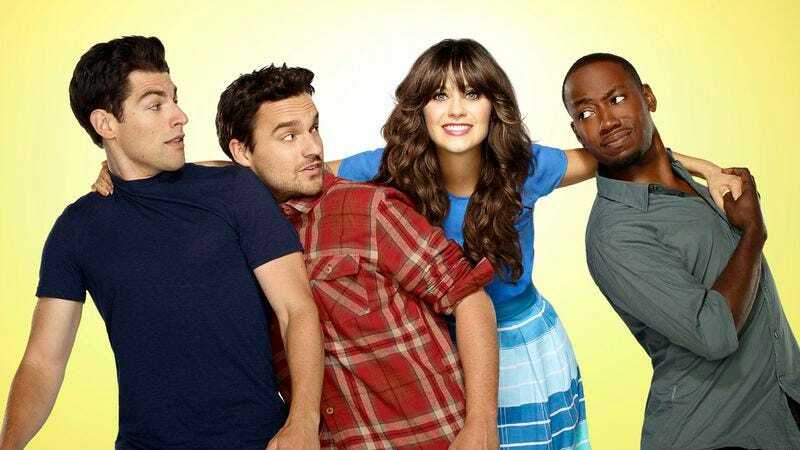 (The line between adult maturity and childhood stupidity is never clear on New Girl and is disrupted often.) Though the episode’s emotional peak is the moment when Nick finally grabs Jess and plants one on her at the end—and Welch makes that moment work by choosing not to cut away, trusting the actors and Winkler’s slow push in on the couple to make the emotions play—its emotional climax comes earlier, when Nick, drunk and frustrated, offhandedly says that when he thought of kissing Jess for the first time, it wouldn’t be “like this.” Jess, taken aback, asks if he’s thought of this before, and there’s a brief moment where it seems everything could come to the surface before the two are back to themselves. Here, Welch underlines the emotions by giving Zooey Deschanel and Jake Johnson’s performances the tiniest amount of room to breathe. Breathing space is an underrated quality on single-camera comedies, with most of the ones that are in vogue (including New Girl) drawing praise for their mile-a-minute patter. But without that breathing space, this is just another wacky scene in an episode full of them, the final kiss doesn’t play, and the season’s most important story arc is a flop from the start. New Girl succeeded so well in season two because it understood that just as much power could come from a pause as from barreling forward. That it mastered both is a sign its editing team deserves recognition.